“Sweatpants, hair tied, chillin' with no make-up on!” Sometimes it’s so nice to be able to take all the fuss out of what to wear today. Tracksuits, do that without a doubt. Already got your two piece on. The one I’m sporting is from SimplyBe’s sportswear section, now in my youth, tracksuits and me were like bread + cheese. 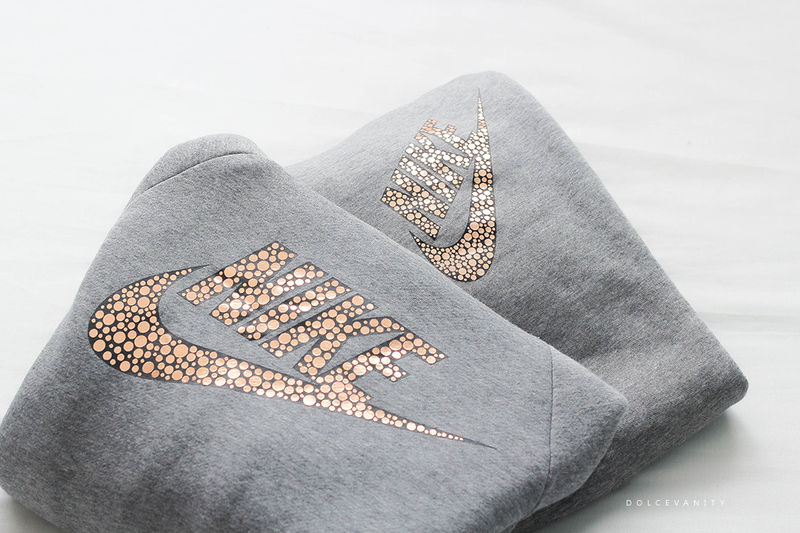 It wasn’t hard to spot this beautiful funnel necked Nike pebble rose gold logo accent with matching sweatpants and automatically want it. SimplyBe are a brand known for fashion for women of a plus sized body. They do now stock from a size 12 – 32 meaning no woman with curves is feeling they have to compromise their fashion wants. During my adulthood, I’ve been a 12 – 16, but I mostly sit in between at a 14 but for comfort with some items I will choose a 16. When looking at the sizes for the tracksuit, I felt it was sized so weird for what I was use too, 12-14, 16-18 20-22 – I mean for me that was odd and I was confused on where I would sit with the size, I decided as it was a tracksuit, it doesn’t matter if it’s baggy but I didn’t want it to be too loose anyways I went for 16 – 18 and anticipated its arrival. Surprisingly, the 16 – 18 fit well besides the arms, I found the way the jumper is cut at the armhole, it’s a little strange. When you look at it, you’d feel you’d get more room because it goes diagonally onto the chest instead of cut around the armhole. Except it was pretty tight on my upper arms. I stretched out the upper arms for a couple days and found it helped to loosen the fabric slightly but it’s best to push up the sleeves from the wrist to get comfortability. Inside both items it’s a fleece fabric so it keeps you warm regardless of the weather, no matter how much I wash it, that fleece is unforgiving with its shedding – but if that’s all I’ve got a problem with it’s not even an issue. What also drew me to the item was the funnel neck hood, I’ve never had a tracksuit with that before and I love it, it’s different and snug.